It is same as the “shadow IT” or the application server under a business analyst’s desk. This is the same server that one fine Monday morning does not work because the business side analyst who owned and operated it has left the company. This server was running critical reports for the executives and nobody knows why the report was not generated this fateful Monday. IT is running around like headless chicken to find the issue with no clue or the trace of this application. Finally, someone connects the dots between the report and the analyst that who left the company. Now IT is on it, to get things under control and provide an enterprise grade quality of service that is its charter to deliver. The software industry has been transforming itself with business models like SaaS (Software as a Service), PaaS (Platform as a Service), IaaS (Infrastructure as a Service) etc… In fact, the class and the abbreviations associated with as-a-service model are ever increasing in this industry. There, clearly, are benefits to this model that has made it attractive, disruptive, and literally a game changing paradigm. For example, building a tech startup 10 years back would have started with a fat check to one of HP, Dell or IBM for servers even before the first line of code could be written. Today, it is a monthly bill of few hundred dollars to start with. You could build a business running on state of the art infrastructure provided by the cloud providers like AWS, IBM and Google providing better quality of service(QoS) than you could yourself do. This proposition of being able to pay-as-you-go (PAYG) has ushered tremendous growth in any industry this model has been applied to. You don't have to look far. Uber is an excellent example of using car as a service. It is better than owning a car if you live in a city. You do not need to do much math taking in account the parking fees, cost of garage, maintenance, insurance and so own. Isn’t it better than having a car, maintaining it and then keeping it clean and washed vs. just hoping in a car when needed? Before we get into the question of how the transformation of these services will benefit the consumer of these services, we must appreciate the fact that the benefits are not one sided. As-a-Service model is a win-win for providers as well as the consumers of the service. When we move from buying computer servers and hardware to renting the compute and storage from likes of AWS and Google, we are simply transitioning to a better model that creates advantage for AWS and Google as well as benefits and cost reduction for the consumer of the compute and storage services. Yes, of course there is a disruption and the newer players will dominate the market replacing the incumbent. This is the beauty of innovation and capitalism that we always move to a better state driven by the economic forces. This is also an alarm and a call to action to the providers of the utility services to quickly transform themselves into as-a-service model and not be left behind. Luckily for them, they don't have to look far. They can learn from the technology sector and adopt the business models as well as the tools to make the transformation economically viable and strategically competitive. 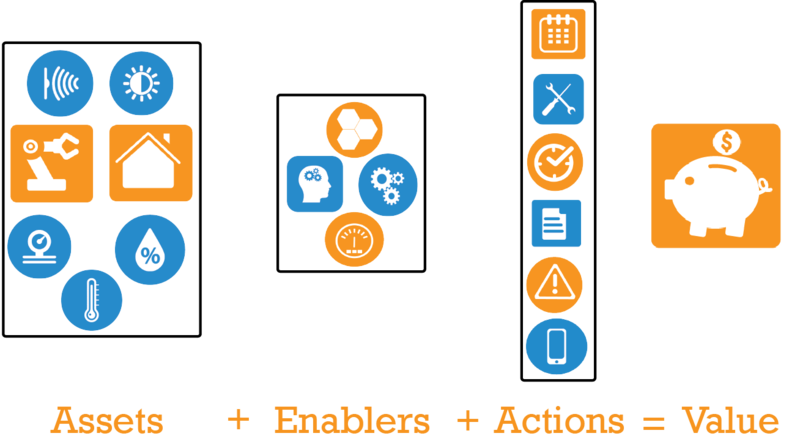 What are the key transformations for change from “sell and provide support” to “as-a-service” model? For the sake of discussion, lets take an example of a water filtration, water heater or HVAC business. All of these share similar traits along with many other such businesses. Any of these businesses will sell a capital good or an equipment and will then sell a support plan providing maintenance and upkeep. These businesses will try to up-sell, and make sure they replace or upgrade the equipment in time to generate new revenue as well as provide good performance to the consumer. First key transformation that these businesses need is to make the equipments “smart”. With IoT (Internet of Things), this is not a difficult task. You need to interface the electrical/electronics to a microprocessor/microcontroller combination which is connected to the internet. This way you can capture the field data from the equipments and also be able to remotely interact with them. Second transformation is to have a platform or mechanism that can enable the “smarts” on the equipment to interact with the rest of the world. You need a platform with core capability to enable integration between diverse devices to send and receive data and enable command and control with the software systems on cloud, SaaS or your own data centers. Monitoring of health, diagnostics and remote management is needed to provide superior Quality of Service(QoS) to the customer. This will induce the customers to change to new as-a-service model vs the traditional buy and operate model. Tracking of usage of the output and the inputs needed for the service operations will provide the utility provider needed data to correctly bill the customer as well as create economically viable and attractive pricing plans. Effective measurement and smart analytics is required to be successful with the billing and the pricing in this new business model. The analytics on the measurements of usage, operations and equipment health will provide predictive models for proactive maintenance. It will predict when to replace the equipment before it fails causing interruption and inconvenience to customer. It will also offers opportunities to up-sell better service plans based on usage patterns and the identification of customer needs. If you are now thinking, it is all good but how do I make it happen, then we are here to help. 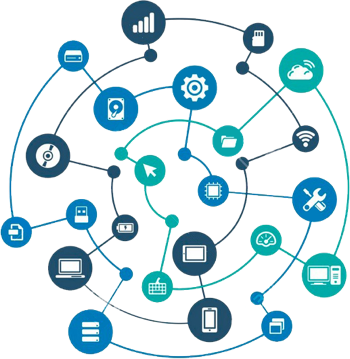 At RoboMQ we have build a complete Internet of Things(IoT) and SaaS Integration Platform for helping businesses transform to as-a-service model. We support all devices and software systems to enable measurements, monitoring, remote diagnostics and building of analytics systems and models. We provide an enabler platform for your business to offer your customers an effective and profitable as-a-service model. If you want to learn more or have us be your partner is this transformative journey, send me a note, visit out website or send an email to sales@robomq.io. It might sound cheesy to say that RoboMQ, a little startup based out of Northern Virginia, has created world’s first visual process builder for Microservices. However it is very true! Using RoboMQ Integration Flow Designer, you can build complex business processes using a palette of functional nodes each of which represent a well defined Microservice running on the cloud. Microservices is an evolution from Service Oriented Architecture (SOA) where it addresses the gaps in SOA and continues to achieve the goals of building applications using truly composable services. It is the fitting platform and infrastructure for the cloud and Internet of Things (IoT). Microservices is an architectural style of building atomic, autonomous, and fine grained services which are single purpose and perform a well-defined task. These atomic units are what we are reffering to as the “lego building blocks”, and they can be assembled to create complex business applications. Microservices reduce the cost of constructing, maintaining, and scaling all types of business applications. Think of it like assembling the business applications versus creating them from scratch. Microservices offer tremendous component reusability, and are extreme elastic to change. As business changes, which is the only constant thing in business, you can change the business applications with minimal impact by changing specific atomic component or the microservice. API gateway which creates the entry point for business functionality. RoboMQ provides a framework for Microservices by providing a multi-protocol gateway through its ThingsConnect suite of adapters and connectors so that you can build applications using any of the industry standard protocol like HTTP/REST, web services, AMQP, MQTT and others. RoboMQ is itself a truly distributed, guaranteed delivery messaging platform that is available on cloud, on premise or as Hybrid Messaging Cloud. 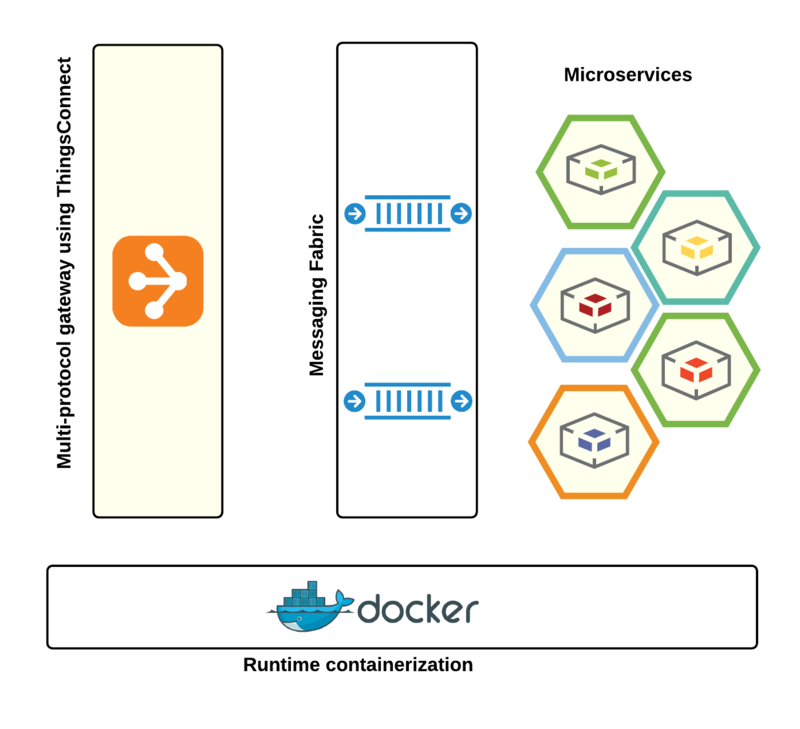 We follow docker container technology, providing you a one stop shop for your Microservices development. We have created a library of fully dockerized connectors, adapters and utility components providing building blocks for Microservices. Build microservices and run them on the cloud, on premise virtual machines or container management platforms like IBM Bluemix or Google Kubernetes with full core infrastructure provided by RoboMQ . If you would like more information on Microservices or RoboMQ in general, please check out our website or send an email to info@robomq.io. For more details on Microservice based architecture, please checkout out the microservices page on our website. In a word, "ThingsConnect" is what makes RoboMQ different from all other middleware solutions for Internet of Things (IoT) and SaaS integration. More than two years ago, when we envisioned RoboMQ, the idea was to create a middleware integration solution that would be the platform of choice for the heterogeneous and diverse future of Cloud, SaaS and IoT integration deployments. We envisioned a platform that could support the diversity of applications and protocols which were rapidly evolving with enterprise SaaS and IoT implementations. Furthermore, we believed that it was critical for RoboMQ to be built to support the yet to be created protocols, devices and applications. The Any-to-Any integration concept, which is inherent in our RoboMQ DNA, is one of the key elements that set us apart from the competition, and enable our customers to succeed through cost-effective, innovative, agile and future-proof application integration within their organization. Middleware platforms are not new. They have been around for over 20 years. The founding team at RoboMQ was running middleware platforms for Fortune 100 telecom companies in the US for almost a decade. We knew that you could only integrate all applications and systems using traditional platforms like IBM MQ or TIBCO if you locked yourself in to legacy code in their proprietary APIs and protocols. It is similar to the old joke that you could get a legendary Ford Model T in any color as long as it was black! Looking towards the future, we thought that the specialized SaaS software vendors would not be inclined to build hooks for the proprietary integration protocols for outdated legacy platforms. Why would they do so? They would ultimately have to choose one of the industry standard protocols like AMQP, REST/HTTP, or Web services to provide integration hooks. SaaS vendors would focus on building the best of the breed business functionality that they specialize in, and would provide open interfaces for data interchange. It is obvious now that the SaaS model is the future of many business critical software applications. There is an inherent value in using SaaS because of better feature sets, a wider user base leading to community-based optimization, and lower pay as you go (PAYG) costs. The key challenge remains, how will enterprises integrate SaaS applications with the rest of the enterprise systems and other applications to enable business processes and tools that ultimately deliver competitive advantages to their business? We clearly understood that the approach of integrating SaaS applications using any of the proprietary protocols, APIs or legacy middleware systems would be cost prohibitive and painful. What the world of Cloud, SaaS and IoT was missing, and really needed, was a protocol agnostic middleware that could be delivered under iPaaS, Hybrid or Enterprise hosted models, as required. We came up with the protocol agnostic design and approach that allows any application to interchange data with any other using any industry standard protocols. ThingsConnect takes care of the protocol conversation and it sits on top of the RoboMQ message oriented middleware. In fact, RoboMQ does not have any integration API of its own. You can integrate using any industry standard integration protocols or APIs of your choice. ThingsConnect thus makes RoboMQ a protocol-less and protocol agnostic Message Oriented Middleware (MOM). So, what is the ultimate value of ThingsConnect when you compare it with other platforms handling the above use cases? You do not need to code in a common protocol or develop code to retrofit. The existing systems can send and receive information the way they already do. ThingsConnect takes care of the conversion and delivery. There is significant cost savings in terms of development and operations! With future proofing provided by ThingsConnect, you can build your IoT and SaaS infrastructure with options to upgrade and replace with Best-of-Breed applications as technology evolves. You can avoid vendor lock-in to proprietary or dying technologies. With our message oriented middleware and Microservices architecture, you can build truly reusable services that can be created to integrate and automate complex business processes and applications.